Many of the largest dams and reservoirs in New Zealand have been developed principally to produce hydroelectricity. Other uses include irrigation and municipal water supply. Other schemes are standalone developments associated with specific sites. The Tongariro Power Scheme (1,400 GWh) diverts water from the south side of Mount Ruapehu and the west and north sides of Tongariro into Lake Taupo, and thus eventually into the Waikato River. The river was developed in multiple stages. The Waitaki dam was built first, without earthmoving machinery, followed by the development of the Aviemore Dam on Lake Aviemore and Benmore Dam on Lake Benmore. Lake Pukaki was initially dammed at this stage to provide storage and flow control. A small station was also installed on Lake Tekapo, but although it has a small dam to raise the pre-existing lake, water was taken through a 1.6 km (1 mi) tunnel to a powerstation below the level of the lake. In the 1960s, work was started on the Upper Waitaki project. This project consisted of taking the discharge from the original Tekapo (A) station through a power canal, the Tekapo Canal, to Tekapo B station at the edge of Lake Pukaki. The dam at Pukaki was increased in height. Water from Pukaki is then transferred into the Pukaki Canal which meets the Ohau Canal from Lake Ohau into Ohau A station and Lake Ruataniwha. The Ohau Canal continues beyond Lake Ruataniwha to Ohau B midway along, before emptying through Ohau C into Lake Benmore. Project Aqua was a proposed scheme of six dams on a man made canal running from the Waitaki Dam to the sea. It was cancelled by Meridian Energy on 29 March 2004. Manapouri does not rely on a high dam to provide water – it takes advantage of the natural 178-metre height difference between Lake Manapouri and the sea at Deep Cove in Doubtful Sound, in Fiordland. The power house is in an underground cavern, while two tailrace tunnels take the water from the power house 10 km (6 mi) to Deep Cove and the sea. 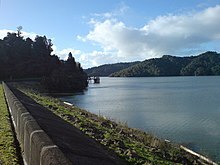 The Manapouri Control Structure (Mararoa dam) downstream from the original outlet of Lake Manapouri controls the lake level, and feeds water from the Mararoa river back up the river into the Lake. ^ Morton, Jamie (28 June 2011). "River users fight power giant's changes to dam". The New Zealand Herald. Retrieved 30 June 2011. ^ a b c d e f g h i j k l m n o p q Offer, R.E. (Robert) (1997). Walls for Water: Pioneer Dam Building in New Zealand. Palmerston North: The Dunmore Press Ltd. ISBN 0-86469-313-3. ^ IPENZ Engineers New Zealand, Engineering Heritage Register,Birchville Dam, retrieved 29 December 2010. ^ IPENZ Engineers New Zealand, Engineering Heritage Register,Johnsonville Waterworks, retrieved 29 December 2010. ^ IPENZ Engineers New Zealand, Engineering Heritage Register,Korokoro Dam, retrieved 29 December 2010. ^ Wellington City Council, History of Water Network, retrieved 29 December 2010. ^ IPENZ Engineers New Zealand, Engineering Heritage Register,Morton Buttress Dam of 1911, retrieved 29 December 2010. ^ IPENZ Engineers New Zealand, Engineering Heritage Register,Lower Karori Dam, retrieved 29 December 2010. Offer, R.E. (Robert) (1997). Walls for Water: Pioneer Dam Building in New Zealand. Palmerston North: The Dunmore Press Ltd. ISBN 0-86469-313-3. Retired civil engineer and dam inspector examines the development of New Zealand dam construction techniques and uses from the 1860s to the 1950s for municipal water supply, mining, kauri logging and development of the Lake Waikarimoana Natural Dam for hydroelectric power. This page was last edited on 28 October 2018, at 07:35 (UTC).